This was once a glue and paint bomb, purchased on Ebay. 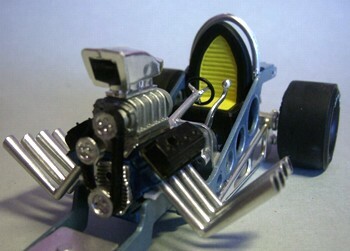 When I received the kit, I found it to be complete, except from 3 of the 8 exhaust pipes, so I had to scratchbuild those 3. The original kit engine had too much glue on it so I had to replace it with one from the parts box. 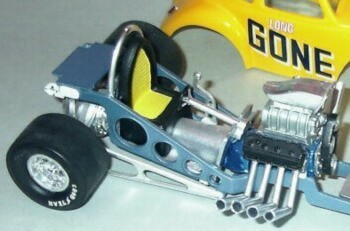 The front wheels simply collapsed and fell apart when touching them, so they were replaced with a set of front wheels from the Tony Nancy double dragster kit. I was in two minds about the scoop, I was thinking about cleaning it up, sanding it, and painting it body color. But as it shows, I choose to keep it in original condition, of respect for the old kit. 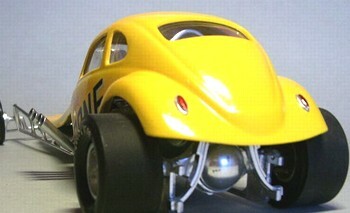 I thought that the rear end looked a little "naked" so I added a pair of rear lights from the parts box. The rear tires were replaced with a better set of slicks, and finally a big missing chip along the left side of the hood, were repaired using a piece of Evergreen plastic, and Squadron filler. The plastic on this kit is very crisp and easy to brake, due to the age of the kit I guess. Recently the rear part of the right side of the frame suddenly broke off, and had to be fixed. Off course after the kit was completely finished. (Thanks a lot Murphy). I painted the frame light metallic blue using a Motip paint bomb, and another Motip bomb covered the body with yellow. The decals is only a temporarily solution, I had to put something there for a modelshow, (in which I won third price competition), I am working on my computer to make the final decals for the car. They will be totally different from the original kit decals, and include a popular cartoon character.